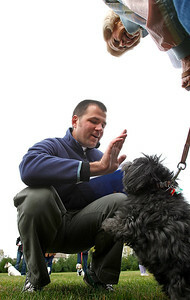 Matthew Apgar - mapgar@shawmedia.com Pastor Dustin Lenz, center, moves his hand in the shape of a cross as he performs a pet blessing on Lucy, a Lhasa Apso owned by Jinny Klopfenstein of Huntley, top, at Living Waters Lutheran Church on Saturday, Oct. 03, 2015 in Crystal Lake. 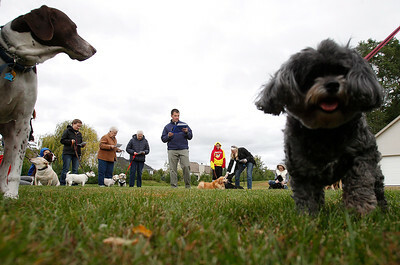 Matthew Apgar - mapgar@shawmedia.com Pastor Dustin Lenz, third from left, performs a pet blessing at Living Waters Lutheran Church on Saturday, Oct. 03, 2015 in Crystal Lake. Matthew Apgar - mapgar@shawmedia.com "Mocha", a Yorkshire Terrier, gives her owner Michelle Reis of Lake In The Hills a big wet kiss on the mouth as Reis attempts to read from a prayer sheet during a pet blessing at Living Waters Lutheran Church on Saturday, Oct. 03, 2015 in Crystal Lake. 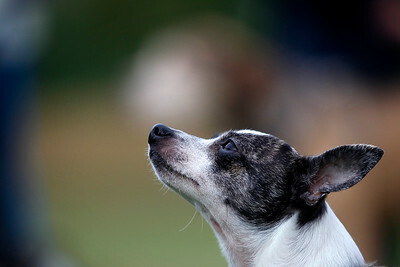 Matthew Apgar - mapgar@shawmedia.com "Juice", a female chihuahua, looks up at Pastor Dustin Lenz during a pet blessing at Living Waters Lutheran Church on Saturday, Oct. 03, 2015 in Crystal Lake. Matthew Apgar - mapgar@shawmedia.com Pastor Dustin Lenz, center, performs a pet blessing at Living Waters Lutheran Church on Saturday, Oct. 03, 2015 in Crystal Lake. 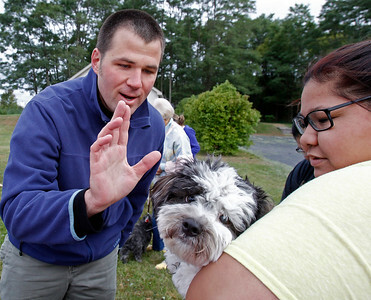 Matthew Apgar - mapgar@shawmedia.com Pastor Dustin Lenz, center, moves his hand in the shape of a cross as he performs a pet blessing on "Gronk", a Bichon/Shih Tzu owned by Kasey Castillo of Huntley, right, at Living Waters Lutheran Church on Saturday, Oct. 03, 2015 in Crystal Lake. 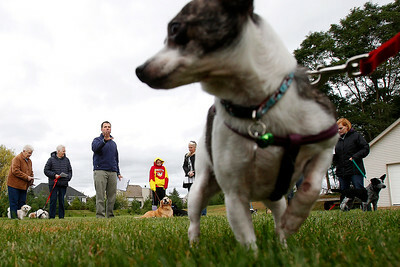 "Mocha", a Yorkshire Terrier, gives her owner Michelle Reis of Lake In The Hills a big wet kiss on the mouth as Reis attempts to read from a prayer sheet during a pet blessing at Living Waters Lutheran Church on Saturday, Oct. 03, 2015 in Crystal Lake.